My Monster: The Human Animal Hybrid explores our enduring fascination with the merging of the human and animal, and coincides with the 200th anniversary year of the publication of Mary Shelley’s Frankenstein. I curated the exhibition at RMIT Gallery from 29 June – 18 August 2018, based on my widely published PhD research. While the research wasn’t intended to end up as a visual exhibition, it became a logical outcome of my visual arts background. The exhibition playfully and provocatively examined the role the human animal hybrid has played in the human imagination. What visual artists can do so powerfully is simultaneously take the viewer into the conflicted and internal world of the hybrid, while at the same time giving a face and identity to the hybrid within the physical but imaginary world. A single artwork can literally replace thousands of words of written text or pages of academic references. The 35 Australian and international artists represented in the exhibition use the hybrid as a varied and powerful metaphor, exploring our complex relationship with maternity and domesticity; segregation and alienation; fractured relationships with the natural environment and other animals, as well as struggles with our public and private personas. 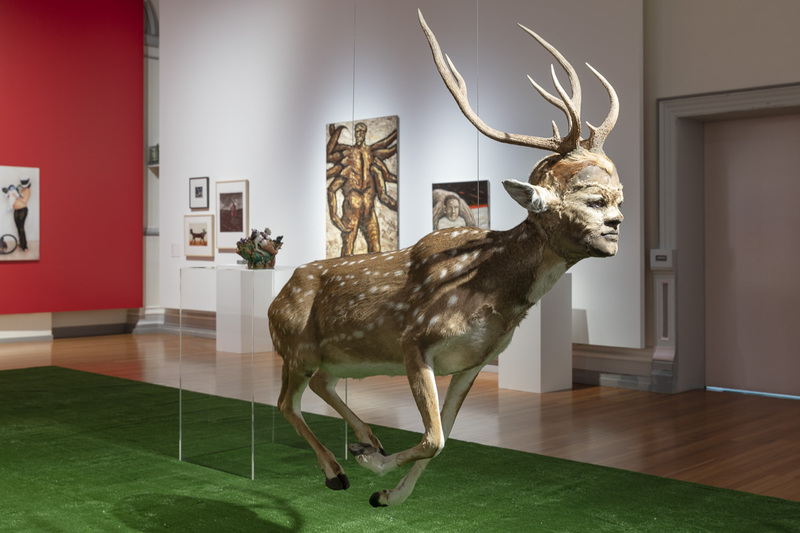 The exhibition examines the artistic representation of the human animal hybrid from mythology to movies; taxidermy to biotechnology; painting and photography to multi-sensory immersive sound installations. The exhibition coincides with the 200-year anniversary of Mary Shelley’s Frankenstein, which gave rise to the portrayal of the mad scientist and outcast hybrid made from human and animal parts. 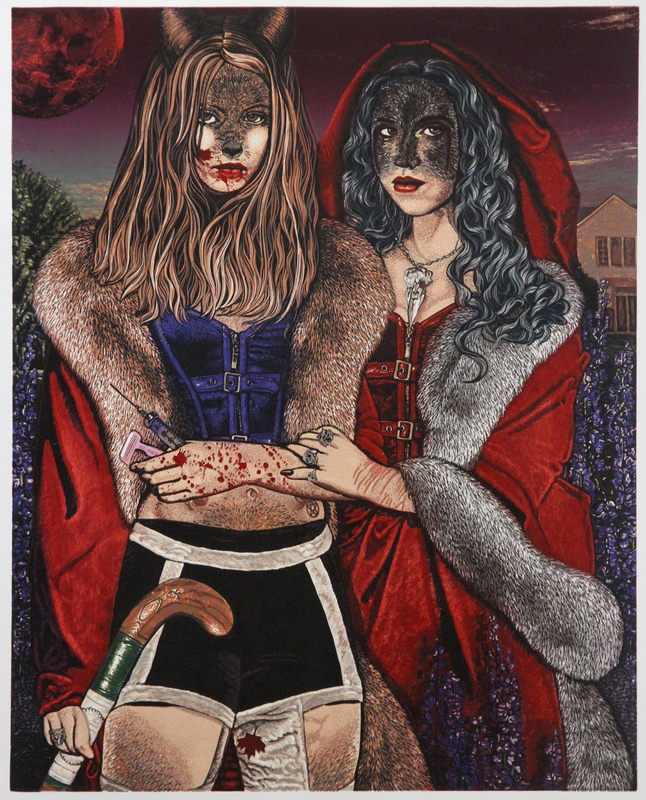 The desire to merge human and animal into one creature has fascinated artists for 40,000 years, with the hybrid constantly updated and reinvented from century-to-century – from Greek classical myths and European folktales through to fairy tales, stories of werewolves and vampires and popular culture. New York-based sculptor Kate Clark’s work synthesizes human faces with the bodies of animals, while Melbourne jeweller and taxidermist Julia deVille work is informed by a fascination with the acceptance of death expressed in Memento Mori jewellery of the 15th to 18th centuries and Victorian Mourning jewellery. 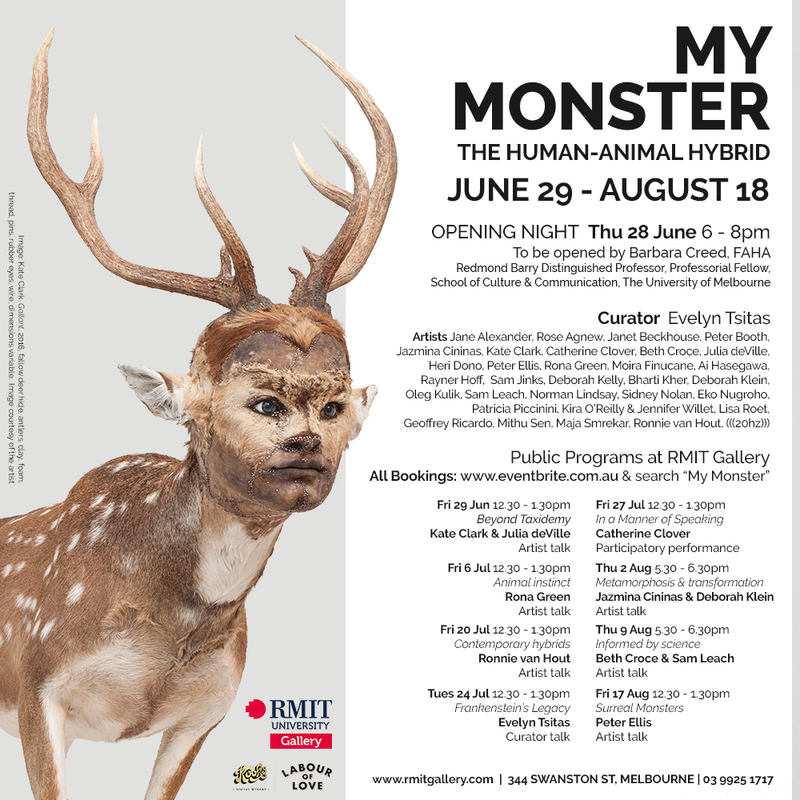 Both artists showcased their work in the RMIT Gallery exhibition My Monster: The Human-Animal Hybrid (29 June – 18 August 2019). She stitches the surreal creatures together like any taxidermist, but has a few quirks that make the art her own: she only works with imperfect, salvaged pelts that would likely be wasted, and patches up their holes—which often occur on their heads—with human faces made of clay. Similarly, deVille employs taxidermy as a celebration of life and sees it as the preservation of something beautiful, only practising ethical taxidermy. I haven’t blogged for some time, and that’s because I have been busy on what universities love to call KT – knowledge transfer. I have turned my PhD research into an art exhibition. From my PhD creative project and exegesis – about 100,000 words all up – comes the first exhibition I have curated – My Monster: The human-animal hybrid – at RMIT Gallery in Melbourne. It opens on Thursday 28 June 6-8 pm, and runs to 18 August. For those who know me as a writer, this evolution of my work into curating is actually not unexpected (my first degree was in visual art – and I have worked at RMIT Gallery for 8 years) – but it’s not the outcome I anticipated from my doctorate in Creative Media. I thought the outcome would be a book, but what came first is an exhibition is based on my PhD research and taking this into a gallery is a form of knowledge transfer. It has taken four years since graduating to get to this stage. Why so long? Well, it takes time to pitch new ideas from your research, to submit chapters to publications and conferences, and get knocked back, and resubmit. To pitch manuscript proposals and get rejected, to then pitch exhibition proposals, and have some people think the work is too confronting…it’s a long, tough road and you have to be prepared to love your ideas, research, and stay true to your concept, and think long haul. Even after you get your doctorate, it takes time and perseverance and faith to keep going, and writing, and researching, just to get any traction for your work. And this is on top of your day job. I had lots of ideas, images, artists and installations in mind over those four years as a sort of daydream ‘other idea’ about my research. Odd when I spend all my spare time in art galleries, and when I spend all the working week in a gallery…but I was so fixated on the words I thought the images were the optional extra, not the main game. Then, when I was given the green light to go ahead with the exhibition at the start of this year, I had only six months to jump into action. It was a tough gig but let me tell you, when someone actually does believe in your work [RMIT Gallery Acting Director Helen Rayment] and champions your research and the opportunity arises to do something with your research, you do whatever it takes to get the job done. And the timing in the end was perfect – the opportunity arose in 2018 – in the 200th year of the anniversary of the publication of Mary Shelley’s Frankenstein. Shelley’s seminal monster novel explores life and death and reanimating flesh. It is also the story of a hybrid outcast, for Frankenstein’s creature was made as a new species, from a combination of both human and animal parts. Mythology and fiction have long entertained the fantasy of the animal and human fused into one being, and the metaphorical hybrid is embedded in mythology and folklore. The hybrids that appear in art can be whimsical, alluring, and confrontational. While hybrids shock and jolt with their appearance, they also offer an unsettling recognition of the disquieting unease we all feel about our place in the world. Hybrids are the ultimate metaphor for the outsider. Their very existence is a political act, an affront. Like monsters of old, they are harbingers of a future we may not like, but are intent on creating through each twist and tweak of our species through biotechnology. Welcome to the journey of My Monster: the human animal hybrid. It’s my PhD research finally seeing the light of day beyond the academic journals and conferences where it has had its publication and airing in front of the academic cohort. But there is nothing dry and academic about this show, which is delves deeply into animal studies, women’s studies, mothering futures, feminism, critiques on biotechnology and explorations into immersive sound art as well as taxidermy, printmaking, painting, ceramics, sculpture, cinema, and more! I have gathered together the following amazing artists Rose Agnew, Jane Alexander, Janet Beckhouse, Peter Booth, Jazmina Cininas, Kate Clark, Catherine Clover, Beth Croce, Julia deVille, Heri Dono, Peter Ellis, Moira Finucane, Rona Green, Ai Hasegawa, Rayner Hoff, Sam Jinks, Deborah Kelly, Bharti Kher, Deborah Klein, Oleg Kulik, Sam Leach, Norman Lindsay, Sidney Nolan, Eko Nugroho, Patricia Piccinini, Kira O’Reilly & Jennifer Willet, Lisa Roet, Geoffrey Ricardo, Mithu Sen, Maja Smrekar, Ronnie van Hout, and (((20hz))). Rona Green, Dusty Rhodes, 2011, hand coloured linocut, 76 x 56 cm. Image courtesy of the artist and Australian Galleries. Art work features in My Monster: The human animal hybrid. It’s been an incredible journey to translate my research into a visual form. Suddenly, footnotes can come alive as painting, quotes become immersive installations, and references to critical movies become – movies! Now that the exhibition nears completion, seems like it was meant to be all along. But it’s also been a steep learning curve of taking academic research from the page into an art gallery…and all that curating a major exhibition entails. Such as – commissioning new work, liaising with overseas artists via email, talking to local artists, juggling space, budget, freight and even wall colors and plinth sizes. Not to mention writing the catalogue, making a film for the exhibition itself, writing the wall text (condensing 70,000 words of exegesis into 5 x 300 word wall panels…) AND…doing all the media and comms (which is my day job at the gallery). It’s been many late night and long weekends getting the exhibition together – as painfully familiar as doing the PhD and working full time, in fact (what a friend’s husband dubbed ‘the kamikaze method’). I was determined to have my answers ready! Why should anyone care about human-animal hybrids? After all, we are talking about fictional characters from mythology and science fiction; and from folklore to vampires and werewolves; and from films like The Shape of Water, Splice and The Fly and…hang on, aren’t scientists creating pig-human embryos and human-sheep embryos….? Right, then! Human-animal hybrids are big news because they have always been within the human imagination and creative expression…AND because we are live in an age of biotechnology where the almost human is right around the corner. How do we feel about this as a society? How do we cope ethically with the possible creation of people made from animal DNA or material? Doesn’t this sound a lot like…Frankenstein? So – there we go – why the human animal hybrid matters, why we should care, and why now, in the 200th anniversary year of the publication of Frankenstein.